For most of his life, Henry Darger lived in a one-room apartment building, attended Catholic Mass as many as four or five times a day, and worked as a janitor and dishwasher at a hospital. He paid meticulous attention to the weather, even recording it every day for ten years in a journal. He barely interacted with anyone and seems to have had only one friend, who one biographer believes was also his lover. And he also wrote, and drew, and painted, and cut-and-pasted. Thousands of pages, hundreds of illustrations, multiple volumes, and none of it seen by anyone except himself until after his death. Darger was born in Chicago in 1892. His mother died while giving birth to a daughter when he was four years old. The daughter was promptly given up for adoption. He was a troubled, sometimes violent child, and at age eight was sent to an "Asylum for Feeble-Minded Children" due to his excessive masturbation. He ran away when he was sixteen, and spent the next five decades living his circumscribed, solitary existence. In 1972, he moved to a nursing home. He died the next year. 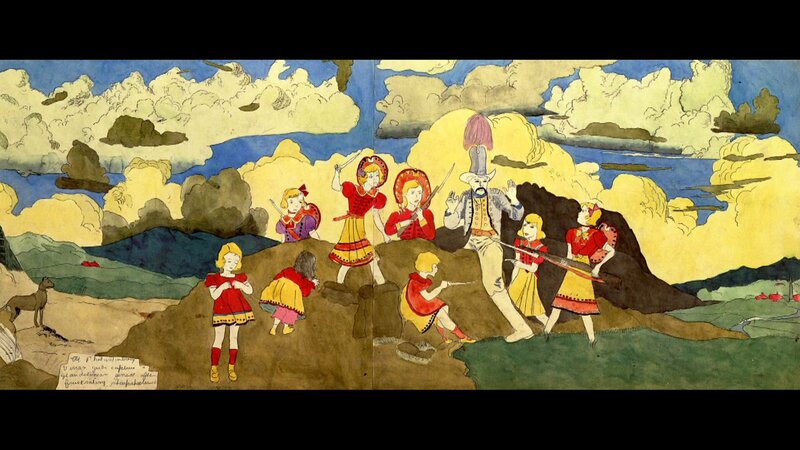 And that marked the beginning of Henry Darger's notice by the wider world. When he left his apartment for the nursing home, his landlord discovered two trunks full of writings and illustrations, as well as walls covered with pictures of young girls cut out of magazines and newspapers. The landlord, a photographer named Nathan Lerner who had trained at the New Bauhaus (later the Institute of Design), prevented the contents of the trunk from being discarded or destroyed. The Hyde Park Art Center exhibited selections of the work in 1977, various galleries including Phyllis Kind and Carl Hammer showed some of it, and in 1997, the Museum of American Folk Art in New York cemented Darger's international reputation by including him in a showcase. Now his work is included in the collection of the Art Brut Museum in Switzerland, and pieces sell for tens of thousands of dollars. What was Darger's creative output? A 15,000-page manuscript written in various colors of ink titled The Story of the Vivian Girls, in What Is Known as the Realms of the Unreal of the Glandico-Angelinian Wars, as Caused by the Child Slave Rebellion, plus an 8,000-page sequel, Further Adventures in Chicago. (There was also an unfinished, 5,000-page attempt at a History of My Life.) They are both illustrated by everything from watercolors to large scrolls featuring young girls, often traced or pasted cut-outs from other media. Often, the girls are naked; some are hermaphroditic. They fight a war; brutal massacres and violent slaughters of the children occur. People have struggled with what to make of it, of what it says about Darger's mind and activities. But it has certainly attracted attention. 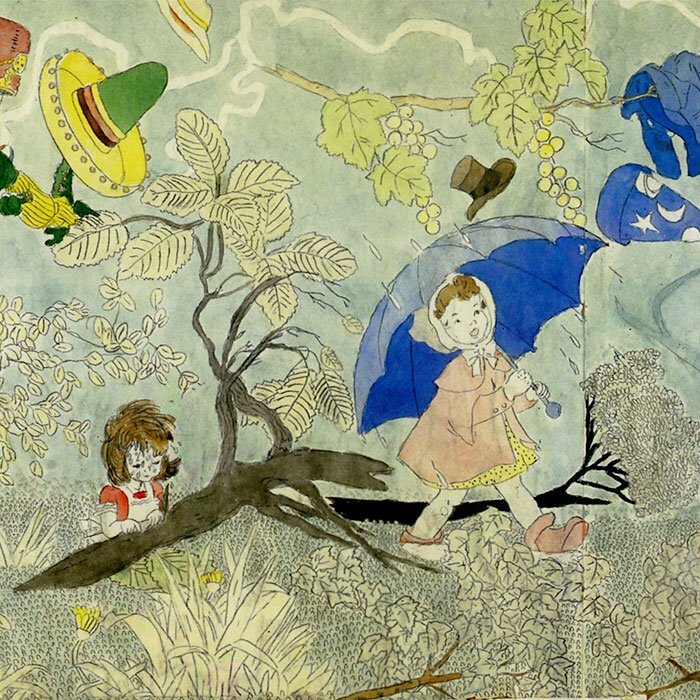 As a Washington Post story put it, Darger is the "outsider artist par excellence."